Some pcs of Non-woven Wheels are put together by using a suitable width and OD tube as central core. The width depends on the requirements of our costomers. They are used for big area workpieces, big metal sheets to reach even finishes without dark/light lines. High effency, sharp, durable, and no dark points. Usage The walls of elevator, stainless steel kitchen utensils, stainless steel sheets and rolls, rolling metal sheets, aluminium and copper sheets, the boxes of computer, man made marble, woodenwares, etc.. Feature No blockage under high rotation speed(3000/min), good brightness, excellent grinding effect, durable for use, workpiece's surface can keep for a standard. Non-woven wheels:18MM/20MM/25MM, etc., Plastic Tube:50MM/76MM/100MM/150MM, etc. Aliminium tube:50MM/76MM/143MM, etc., Steel tube of round, square etc., can also be equiped with flanges of different hole shapes and sizes, Customers can also supply tubes. 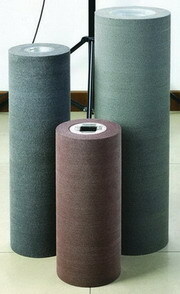 4P-----12Ply, or according customers’ requirement. Note: For big width of more than 40 CM, we suggest not to use Plastic tube.